Lashing and towing equipment can be a vital part of your day to day life. Low Loader chains are commonly used in the agriculture and trucking industries, for heavy duty tasks such as securing a tractor to a flat bed lorry. 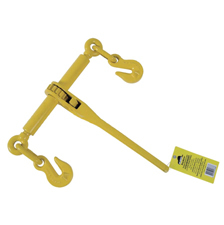 These Low Loader chains work in harmony with Load Binders, which help to tighten and pull chain together during the process of lashing down items. We stock a variety of Load Binders that are able to secure loads up to 18,000kgs, paired with Low Loader Chains ranging from 8,000kg to 32,000kg. 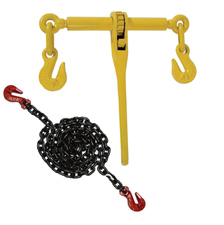 We also give you a choice of hook on this type of lashing equipment to help make sure it best suits your requirements. 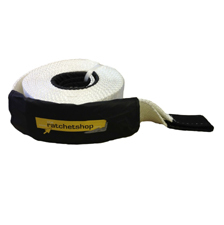 Here at The Ratchet Shop we also stock a range of Kinetic Recovery Straps, all of which are independently tested to ensure high quality performance. At 9m long our Kinetic Recovery Straps are constructed from heavy-duty nylon, and are great for use in a variety of applications.